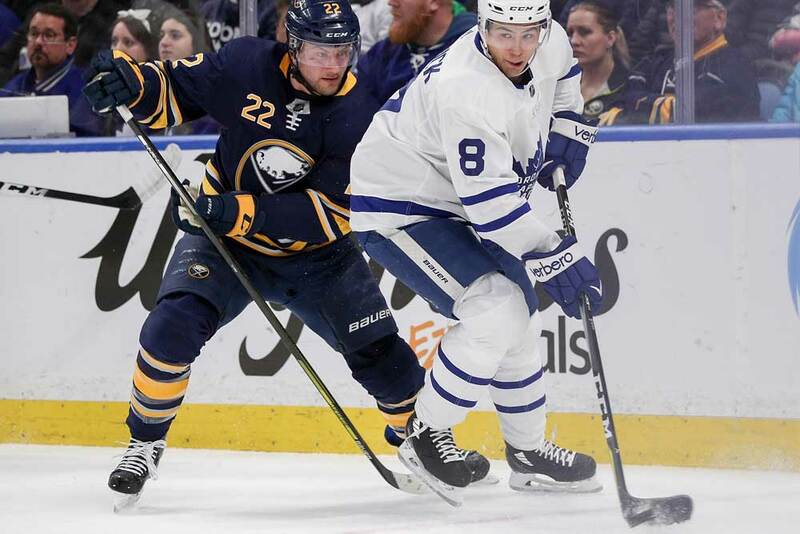 Due to their geographical proximity, there’s always been a touch of animosity between the Toronto Maple Leafs and Buffalo Sabres. With both clubs near the top of the league standings in 2018-19, however, the stakes are now palpably higher. This has the makings of an all-out war in the Atlantic Division. Tuesday night’s seesaw affair offered just a glimpse of this duel’s show-stopping potential. The Leafs (20-8-0) jumped out to a 2-1 lead only for the Sabres (17-8-4) to regain the advantage in the third frame. When it seemed like time was running out on Mike Babcock’s high-flying crew, Toronto tied it up late and ultimately prevailed courtesy of Auston Matthews’ signature top-corner missile…with 2.7 seconds left in overtime. Even on a night when the Calgary Flames and Columbus Blue Jackets combined for 15 goals, the Leafs-Sabres game was can’t-miss television — tense, unpredictable and filled to the brim with superstar moments. In Toronto, Mitch Marner and Matthews run the ship. This duo plays on separate lines at even strength and thus tenders opponents a pick-your-poison scenario: Focus on Matthews, and Marner will attack in waves until he can spoon-feed his linemates. Focus on Marner, and Matthews will make you pay for the slightest bit of room you grant him. By virtue of his motor, Marner is the more visible player of the two. He’s downright relentless in his aim to create for his teammates — sometimes to a fault — as he’ll circle, stop, start, regroup and repeat the cycle until opponents buckle under the pressure. With a proven finisher in John Tavares as his center, he’s emerged as a budding superstar: He has 39 points (fourth in the NHL) in 28 games and Natural Stat Trick indicates that Toronto controls 53.3% of scoring chances when he’s on the ice. For Matthews, that otherworldly wrist shot is the great equalizer. Despite scoring 15 goals in 14 games and leading the league in points per game (tied with Colorado’s Mikko Rantanen at 1.64), he hasn’t meshed well with grizzled winger Patrick Marleau. He fares significantly better without him (59.6 CF%, 61.3 SCF%) than with him (48.2 CF%, 47.2 SCF%), as Marleau has failed to engage in the forecheck on time or extend cycles. Comparing their individual points percentage (Matthews’ 92.3 vs. Marleau’s 35.0) reveals just how much of the heavy lifting Matthews has done thus far. Nevertheless, the third-year pivot has left his imprint on games because his release continues to stupefy netminders. His ability to fire from different angles with such fluidity, velocity and accuracy is unrivaled. By the time goaltenders think they have a read on it, the puck is already in the net. Beyond his world-class shot, Matthews is an underrated playmaker, competent defender and one of the finest thieves in the NHL, routinely stripping the puck off opponents to create something out of nothing. That’s just it, really: When he’s out there, you get the sense that anything can happen in the blink of an eye. His buzzer-beater on Tuesday night was proof positive. 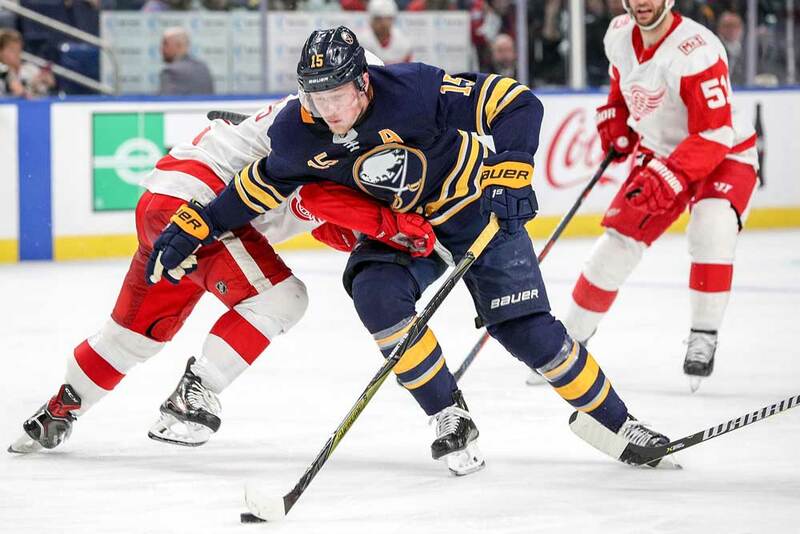 On Buffalo’s side of the equation, Jack Eichel is the leading man. In his fourth NHL campaign, he’s attained new heights with 34 points in 29 contests. He is absolutely dynamic in the neutral zone, effortlessly gliding past the opposition before choosing whether to deliver a pass or unleash his shot. His combination of reach, speed and patience is a nightmare to deal with in open ice. He doesn’t tip the scale heavily from a possession standpoint, but no one on the Sabres does. His team-relative metrics show that he’s carrying a very heavy burden and delivering the goods. Against the Leafs on Tuesday, he displayed wonderful poise on his second tally of the night. Following a turnover by Nazem Kadri, he found himself with a ton of daylight. Rather than rushing a shot, he realized that Leafs defender Nikita Zaitsev was affording him far too much room, dipped inside and finished upstairs on Frederik Andersen. Newcomer Jeff Skinner is flanking Eichel this year, and the partnership has proven mutually beneficial. The former Carolina Hurricane winger has 20 goals in 29 games. He brings a different skill set to that top unit, creating separation from defenders by using his shiftiness and edges. The Sabres control 52.6% of shot attempts, 51.6% of scoring chances and 71.4% of goals scored during his 5-on-5 shifts. Defensively, 2018 first overall pick Rasmus Dahlin is the real deal. After shrugging off some early-season hesitancy, he’s now flashing his talent and composure with the puck, slicing through the opposition’s defensive posture like a hot knife through butter. He’s still raw as a 200-foot player, but to ooze this much pro potential at 18 years old — let alone as a defenseman — is stunning. He’s already among the leaders on the blue line in CF% (49.5), SCF% (47.1%) and GF% (57.9%). His arrival is the most significant piece of the puzzle. Throwing a legitimate star defenseman into the mix creates more balance between the clubs, and his role should only expand from here on out. As evidenced by his monthly splits, his ice time continues to increase. If his confidence follows suit, then Buffalo may well cement itself as a true playoff contender. That’s the crux of this battle: Buffalo must show that it isn’t a flash in the pan. With head coach Phil Housley’s emphasis on pace and puck pressure, it looks as though he’s concocted the right strategy for his personnel. Despite the skill on hand, it’s clear when watching the games or looking over the numbers that neither Buffalo (47.9 CF%, 45.5 SCF%) nor Toronto (49.3 CF%, 50.1 SCF%) dictate the play all that convincingly. That’s precisely why they’re so intriguing: Much like Pittsburgh’s recent championship squads, they have such special talents that they can overcome serious flaws and conventional hockey wisdom. Though they aren’t quite there yet, they’re racing each other to the top of the mountain while putting on thrilling displays of hockey. Matthews, Marner, Tavares, Eichel, Dahlin, Skinner. These stars are making fans forget years of misery. There’s a decidedly new flavor to this old rivalry — and we’ve only skimmed the surface. In 2015, the Sabres reportedly believed they had reached a deal in principle for Babcock to coach their team. He ultimately joined the Leafs. On the ice, there’s no love lost between Kadri and hulking blueliner Rasmus Ristolainen. 22-year-old forward William Nylander, who recently re-signed in Toronto for six seasons, will soon return to the lineup. His younger brother, Alex, was Buffalo’s first-round pick in 2016. Facing off regularly as divisional foes should only compound the built-in hostility. If familiarity does indeed breed contempt, there’s no shortage of fodder here.